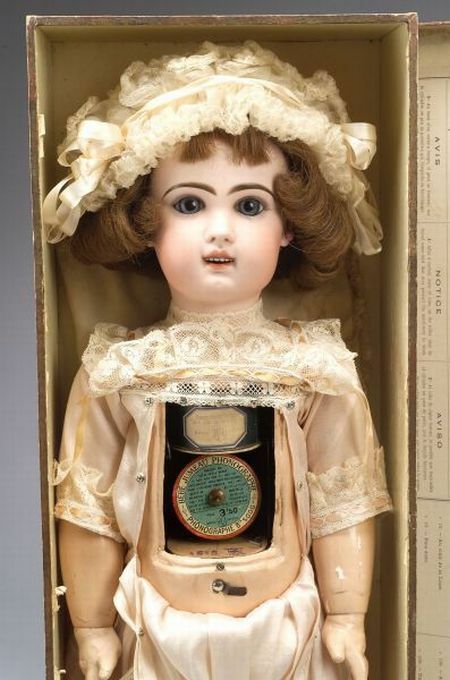 Bebe Jumeau Phonographe Doll, stamped in red Depose Tete Jumeau 11, with blue feathered paperweight eyes, open mouth, upper teeth, pierced ears with earrings, cork pate and original brown human hair wig matching finely lined brown eyebrows, on jointed composition body with chest cavity with metal cover containing key-wind Lioret "Le Mervellieux" phonograph, No. 1646, with HL ink-stamp and paper label on the reproducer Phonographe Systeme Lioret, Bte. S.G.D.G. Patents, Marque HL de Fabrique, in original pink satin dress with drop-front panel, ribbon-laced collar, ivory silk bonnet, socks and size 11 shoes stamped with bee symbol and Depose, ht. 24 in., with four cylinders (three in cartons) and original Bebe Jumeau Phonographe box, the lid with instruction label and list of cylinders in French, Spanish and English, (box lid split at one end, body with some paint loss, otherwise good original condition). 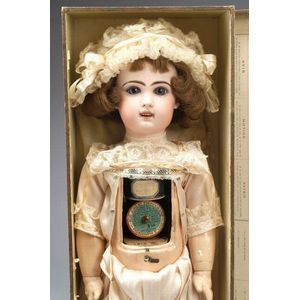 Note: It was Jumeau's request to Henry Lioret (at that time a clockmaker) to produce a speaking mechanism for his dolls that inspired Lioret to take out his first patents for a phonograph in 1893. The "Merveilleux" movement as a phonograph in its own right came in 1895, the dolls having initially been too expensive and unreliable to sell well; however, they seem to have achieved more success by 1900. Lioret carried on, working on sound for films and doing war work in 1914 -18; he died in 1938 at the age of 90.